Dimensions (HxWxD): 0.85" x 0.45" x 0.35"
This unique and beautiful Rose de France Amethyst Super Nova Pendant with round-cut Aquamarine accent stone is a new cut for the 21st Century from our favorite jeweler, Paul Jensen who brought you the power cuts metaphysical tools line of jewelry which includes the Star of David, Ascension Star, Angelic Star and other Tools for Evolution. This pendant originally was unamed but beautiful. We first named this piece a 'honeycomb' pendant because of the unique faceting on the stone. This remarkable pendant combines two spectacular cuts. On the back of the Rose de France gemstone is a modified Millennium Cut, a starburst pattern that was created in the early years of the 21st Century by master jewelers to reflect the emerging consciousness of a new millennium. The surface of the Rose de France Amethyst gemstone is laced with an intricate pattern of flat hexagons, like a honeycomb or the eye of a honeybee. The compound eye of a honeybee consists of an array of hexagonal visual sensors designed to maximize the honeybee's ability to detect tiny movements in shadow and in the lower, infrared light frequencies, enabling the honeybee to achieve maximum awareness of predator movements in deep shadow and also provides amazingly acute peripheral vision. 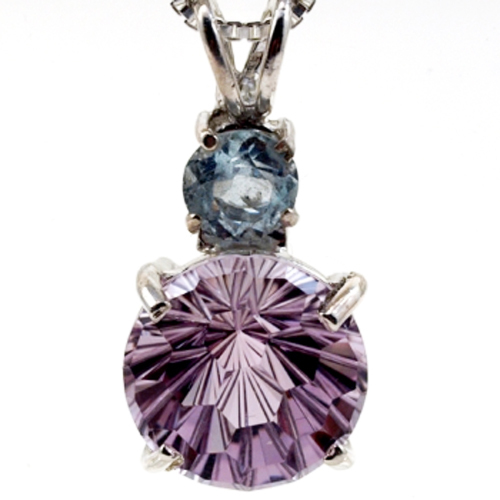 The combination of amethyst and aquamarine energizes the throat chakra and the crown chakra simultaneously, connects the bearer to Spirit, inspires the bearer with Wisdom from Higher Worlds, and empowers the bearer to communicate their own unique truth, one-on-one and through the mass media. Many teachings agree that amethyst crystals are excellent for purification, especially for spiritual purification and protection and that has certainly been our experience in working with all varities of amethyst. Aquamarine is an extremely hard, brilliant gemstone that forms in hexagonal crystalline prisms. Aquamarine is a member of the beryl family -- a cousin of emerald, heliodor and morganite. Aquamarine is usually the color of tropical seawater. The coloring agent in the gem is iron. Lightworkers and crystal healers say that aquamarine is an excellent stone for communication and is called the "stone of courage". Aquamarine is a very helpful stone used for protection and spiritual connection. Aquamarine provides an energetic shield for our lightbodies. This highly prized gemstone assists us to assimilate new knowledge while remaining true to our own highest nature. Aquamarine helps judgemental people to become more tolerant by reinforcing the connection with the Higher Self while clarifying mental activity of all kinds. It is a stone which encourages flow, balance, protection & clarity, attuning us to spiritual worlds while enhancing the connections between our intellectual, emotional and spiritual bodies. Because of its blue-green color, aquamarine is associated with the throat chakra, which is said to be blue or turquoise in the Western chakra system. Aquamarine stimulates, energizes, and cleanses the throat chakra, facilitating communications activities of all kinds, and strengthening the connection between the throat chakra and the third eye chakra, infusing our communications with the wisdom and love found in the Higher Self when the third eye is fully activated. Aquamarine is the gemstone of communication par excellence, and an excellent gemstone for anyone connected with the mass media or networked computing, or working on the Internet. Aquamarine enhances the bearer's ability to speak their own truth in such a way that it is easy for others to accept and understand. Aquamarine is said to infuse the user's mind with the ideal of service to the world, and to help the user develop a strong commitment to furthering the spiritual development of all humanity. This same property provides the user with increased access to the akashic records, the energetic templates containing the patterns of perfection that govern the birth, growth and development of the human body (the microcosm) and the universe (the macrocosm). Lightworkers will want to place this stone in the client's hand or on their client's throat chakra during energy treatments to facilitate mental acuity and energize the individual with the courage to speak their own truth. Note: Weight above is shipping weight. Actual weight of this pendant is .2 oz. Each piece is unique and may vary slightly in appearance. Each piece is guaranteed to be beautiful and to meet with your complete satisfaction!